Our eyes can tell us a lot about ourselves, as we look around a room our eyes linger longer on things we find interesting. If we follow the tracks our eyes make looking at a face for example we discover that we spend far more time looking at the eyes, nose and mouth regions, as these are where the interesting things tend to happen. We can build computer vision systems that detect where our eye gaze moves, and use this to allow new ways of interacting with computers, for example helping disabled people operate software simply by looking at the right part of a screen rather than having to click a computer mouse or use a keyboard. But our eyes can also tell us something else. They can also tell us who you are. The field of biometrics, identifying an individual by measuring some body characteristic, is becoming ever more important these days, and like fingerprints the pattern in the iris of your eye (the coloured bit) is individual to you. There are several systems currently being built that can recognise the iris patterns and identify you as you. These systems have been tested in airports as a quick way to verify that the passenger is who they say they are, and there are plans to include so-called iris scans in the new UK ID card scheme. So how does our iris develop its characteristic pattern? It starts when we are embryos in the womb, and actually grows from the retina, the light sensitive part at the back of the eyeball, as our eyes develop. The iris includes two layers of muscle called the outer radial and inner circular layers, and it's the structure of the muscle fibres in these layers that give our irises their pattern. The muscles also let the iris change size quickly to allow more or less light into our eyes depending on the lighting conditions, so allowing us to see over a range of conditions from darkest night to a brilliant sunny day on the beach. The iris needs to be able to block the light coming in, but without an extra element, called a pigmentation, the iris would be virtually transparent, and useless at doing its job. It is these chemical pigments that give our irises their colour. In the rare genetic defect that leads to albinoism, the ability to create pigment is absent, these people have light skin, fair hair and a pink iris. They also suffer from vision problems as their irises cannot block the light, which is required for the eye to be able to see fine detail. In humans there are two eye colour pigments, melanin (brown) and lipochrome (yellowish-brown). Increasing levels of these pigments mix together to create blue, green, hazel, and brown irises; your actual mixture is determined genetically. It is also possible that parts of one iris may be a different colour. In rare cases one iris can be a different colour than the other iris, this genetic condition is called 'heterochromia irides'. Building a computer model of the way our irises develop will give us a way to test our understanding of the biological process. In one computer science student final year project at Queen Mary this was done, using detailed medical research from embryology on the way the muscle layers in the iris develop. The computer program included muscle fibres that 'grew' and broke in similar ways to the biological fibres, and gave some very realistic results. The picture above is one example produced by the program. This computer-generated iris were then compared statistically to a real iris to see if the types of patterns produced looked the same, and they did. 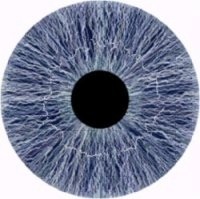 A good computer generated iris has applications in testing iris scan systems, and also in computer graphics for movies. So the next time you look deep into someone's eyes remember that what you are seeing is an exquisite piece of optical engineering. It's really quite an eye opener.